If you look at Julia’s original design, you’ll see that the pattern came in two versions; as fingerless mitts and full mittens. When I showed the pattern to my intended recipient, she loved the design except for the garter ridge around the upper part of the mitten and on the thumb. She also lives in Chicago and told me that she’s cold all winter. Since I wanted these to be extra warm, and since I wanted to drop the third garter rib, I decided to continue both layers all the way to the finger tips. 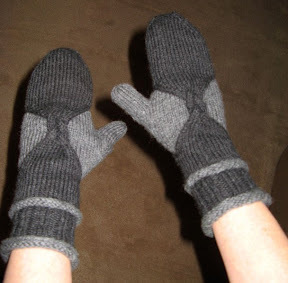 On Julia’s original mitten design, only the inner layer continues, after acting as the bind-off for the outer layer of the mitten, which serves essentially as a design element. I figured that I might as well use the outer later as a functional (as well as fun!) component. My modifications were very straightforward. When I got to the the point in the pattern (on the inner layer) where she calls for you to stop knitting and put the live stitches on waste yarn in order to start working on the outer layer, I just kept merrily knitting along, following the instructions for the outer layer to begin decreases at the tip of the little finger. On the outer layer I just went a row or two further in order to give the inner mitten some room. Oh, and since I’ve been asked this by nearly every knitter who has tried these on… That yarn is Cascade 220.